The Queensland Government is planning for the future rail needs through the Inner City Rail Upgrade Project. As south east Queensland?s population is estimated to grow from 2.9 million to 4.3 million by 2026 and freight movement is set to increase, upgrades to inner city rail services will ensure growing demand can be met. The Queensland Government has committed more than $7.3 billion to upgrade inner city rail through strategies identified in the South East Queensland Infrastructure Plan and Program 2008-2026. To help determine suitable solutions to increase capacity, Queensland Transport engaged independent consultants Maunsell Parsons Brinckerhoff to conduct the Inner City Rail Capacity Study. The study found that inner city rail required an additional four tracks (a doubling of existing track capacity) on two new lines to meet the growing demands on our rail system over the next 20 years. These new lines will ideally be constructed in a two-phase upgrade of inner city rail infrastructure. Phase one will connect the southern (Beenleigh/Gold Coast) rail line to the northern (Caboolture/North Coast) rail line through the inner city by 2016. Phase two will connect the western (Ipswich) rail line and to the northern (Caboolture/North Coast) rail line through the inner city by 2026. Infrastructure such as new routes, tunnels and underground stations are key features of the proposed upgrades. Queensland Transport will now undertake a detailed feasibility study to decide on a preferred phase one route. Determining any preferred rail alignment for our future needs must be carefully planned to ensure all options have been sufficiently investigated. The detailed feasibility study will commence shortly and is estimated to be completed by mid-2011. Completion of this study will allow construction to commence in 2012. The Inner City Rail Capacity Study was listed in the initial Queensland submission to the national infrastructure audit. It is listed as an 'urgently needed urban congestion project'. The Queensland Government is seeking funds from the Federal Government to complete this project within the required timeframe. As posted in another thread, I think there is a major error in the current planning for this project. At present, they have not included an interchange between the new proposed line and the existing lines at Central. This is absurd! An interchange is essential to provide connectivity and allow for cross-town commutes (eg Toowong-Wooloongabba). The new alignment along Edward St is fine as proposed, but there has to be a station at Central with a large concourse excavated under Ann St to connect with the existing station. The main entrance of the new combined station would lead off Anzac Square into the concourse under Ann St, with escalators up to the existing platforms and down to the new platforms under Edward St. The new 'CBD' station could be moved southeast to span between Charlotte/Edward - Mary/Edward instead of Elizabeth/Edward - Charlotte/Edward as proposed. It doesn't look like they are asking for feedback at the moment. I hope they get some decent planners on the project before it is too late! I agree. Not building an interchange at Central would be a major mistake. Whilst I'm all for integrated transport, does Brisbane really need a "Circular Quay"? Unlike Sydney, Brisbane does not have a hub of ferry services that need connecting with other public transport. We already have a bus/rail interchange at Roma Street, and almost a Bus/Rail interchange at South Brisbane and South Bank. There will also soon be a bus/rail interchange at Park Road. The basis of my post, was the "opportunity exists" (or one day will). There has, for some time, being considerable debate and alot of dis-satification with Qld Govt "Northbank" proposals. Sooner or later, a complete reworking of North Quay is going to be required - it's becoming a bit of a bottleneck. The opportunity will arise to remove the congestion of a major bus tunnel exiting from underground at North Quay - put it right under the river when the rail tunneling is being done and get the buses right off North Quay street level activity - but of course keeping the bus station. Req'd or not, the opportunity will present itself to have buses, rail and ferries meet in close proximity and the ferry terminals are not the most advanced - and remember, we are looking ahead some years here! With the current bus movements, that idea would only remove about 2 fifths of the bus traffic from the Victoria bridge. Buses will still need to service Adelaide and Elizabeth streets from the Victoria Bridge. There is however, a plan to build another Bus Only bridge from Adelaide Street to the Cultural Centre merging with the Victoria bridge at the Cultural Centre. This is only in the planning stage ATM and with the current financial market, it may not become reality. RAIL Back On Track (http://backontrack.org) a web based community support group for rail and public transport and an advocate for public transport users has said that there is need for an acceleration of the proposed inner city rail upgrade to ensure an efficient rail network. "The Inner City Rail Capacity Study was listed in the initial Queensland submission to the national infrastructure audit. It is listed as an 'urgently needed urban congestion project'. The reason it is an 'urgently needed urban congestion project' is that the 4 tracks that currently carry QR Citytrain services through the CBD axis are nearing their capacity. Currently the suburban and main tracks carry up to 19 and 13 trains per hour (tph). Theoretically around 6 more tph could be added on each track. However the reality of the current infrastructure constraints makes this increase impossible to operate." "Even with the inner city tracks running at full capacity, the increasing patronage on QR Citytrain will mean that the existing inner city tracks will soon be insufficient for the required number of train services. As the patronage increases the system will slow down effectively reducing capacity due to extended station dwell times." "New inner city rail lines will need to be built across under the city, linking with the existing rail network at each end. The first new line should be built from Dutton Park to Exhibition - Bowen Hills to take pressure off the services that currently cross the Merivale Bridge - currently the busiest section of the QR Citytrain network." "The construction of the Dutton Park - Exhibition line connection will not only provide relief for cross river and CBD rail operations but would also relieve the demands on the road network for destinations such as the Gabba, Gardens Point/Parliament House area of the city and Royal Brisbane Hospital/Exhibition." "An essential and pivotal part of the concept if it is to be effective is a rail to rail interchange between the new line and the existing rail system at Central." "Examples of other current infrastructure constraints include the single track sections on the Cleveland and Ferny Grove Lines. Infrastructure projects are urgently required to remove these constraints to allow the existing inner city tracks to be used at their maximum." "Queensland, we need to get cracking or we will be a failed transport state!" after recently returning from a trip to Sydney i was once again astounded by how much better the entire system is down there [5-15 min off peak on most lines, good trains though many have graffiti and a station for everything] for example Sydneys new epping to chatswood line opened in February and the stations are modern,underground and a 15 min service. why could something not be done here example park road to toowong with a station at UQ and etc why we do not have stations at major sporting grounds amazes me and the lack of liking between lines why cant we have a cleveland to beenleigh extension or a ferny grove to petrie connection. of course all of Sydney say that there rail system is terrible and underfunded.I was amazed at the fact that parramata station [could be the equivalent of Ipswich though others will argue] was the fact that this was a modern well maintained station and was completely covered along the entire length of the platform. I guess not many have visited Brisbane! RAIL Back On Track (http://backontrack.org) a web based community support group for rail and public transport and an advocate for public transport commuters has suggested that the tunnel machines being used for the Clem Jones tunnel could be used to build the Inner City Underground rail extensions. "The tunnel machines being used to bore the Clem Jones tunnel will soon have completed their tasks. "The diameter of these machines bore is 12. 4 metres. (1) A size which is more than adequate for a standard QR double railway line with overhead electrification. "The Inner City Inner City Rail Upgrade Project (2) is now urgently needed to provide capacity on the rail network. "Wouldn't it make sense to use the tunnel machines already in Brisbane? Construction of the rail tunnels could be started this year. Why wait till 2012?" There is no reason why the Queensland Government could not make an immediate start on this project. All of the Geo-technical information gained from the construction of the Clem 7 tunnel would also apply for the section from Fairfield/Dutton Park to the crossing under the river to Gardens Point which should mean that the equipment, one of the Clem 7 tunnel boring machines, experienced tunneling machine operators and engineers from that project would also be avaliable to enable tunneling to commence at least as far as the Wooloongabba Bus Station and further design works for the tunnel and stations beyond that point could be carried out while that first stage was being constructed. A further application for Commonwealth funding would then have more weight for the further extension of this line ender the river to a station in the region of Parliament House / QIT and on to a rail to rail interchange station under the existing Central Station. This would take the pressure off the section of line from South Brisbane accross the Merivale Street Bridge and through the CBD between Milton and Bowen Hills as well as servicing both the Gabba and the Alice Street end of the City and relieving the loading on the road networks in both of those areas. This is alleged to be the smart state so perhaps some switched on politician might like to attempt to explain to the electorate why not. If I look at cities with well developed metro/rail systems they have lines that intersect at many points. This allows people to move around the city rather than always through it. The study appears to be focused on how do we get more volume on existing lines through the the CBD not create new lines to allow more cross-city movements. One idea may be to take Oprtion A from Spring Hill to Kelvin Grove (linked to Busway Stop) and then along Enoggera Road to Alderley and onward to Albany Creek and back to Strathpine. The Exibition Station would be duplication of the RBH Busway Stop. Route D could connect from Toowong through the western suburbs using enmore Bypass corridor onto Ipswich. The other end could go from the CBD to Newstead/Teneriffe then Bulimba and connect to the Doomben line with a stop at the new Portside Development. Whilst some talk of action is better than nothing - because nothing is what we've had alot of in SE Qld when it comes to rail expansion, it is still altogether, far too slow a process. One can get quite downcast when one looks at the lack of serious rail progress in this part of the world over the last few decades - and man-oh-man, are the chooks coming home to roost - assuming they can fit in! I say it's essential for the Inner City Rail Upgrade Project to go ahead in the short term, for SEQ to maintain a decent, well patronised, passenger rail system. Only then will it be efficient to duplicate lines to the terminus' at Ferny Grove & Cleveland. Presuming that the decision-makers continue to be authentic in their words, I see the main deciding factor being financing of this project. Let's hope that some seeding money is given Tuesday night in our budget. Next, it needs to be well spent - with not one cent siphoned off to road projects. duplicate lines to the terminus' at Ferny Grove & Cleveland. Looks like the Federal Budget will get his going which is excellent news. I am fully behind the upgrade so we can have 2-5 min services on the existing lines. My only concern is that in SEQ we need many new lines and how has this been included in the mix? If we need to spend $14B to just meet the needs of the existing lines, what is it going to cost to intruduce new cross-city lines? Transport Minister Rachel Nolan has welcomed the Federal Government's budget announcement of $20 million for Cross River Rail, a major rail project to improve rail capacity and frequency through the Brisbane CBD. Ms Nolan said the committed funding would facilitate detailed planning including the selection of a preferred corridor, the preparation of an environmental impact statement and extensive community consultation." Ms Nolan said the project, which could cost up to $8.2 billion when completed, would provide a new rail link through the inner city, connecting the North Coast/Caboolture rail line with the Gold Coast/Beenleigh rail line. "This is a small but important first step for this major project, which is so significant that it will remain a national priority for years to come," she said. "This will provide south east Queensland's rail passengers with more frequent train services, new destinations and modern facilities. "The proposed network improvements will deliver a more efficient and convenient way of travelling by train with easier, quicker interchanges both between rail services and with other types of transport. 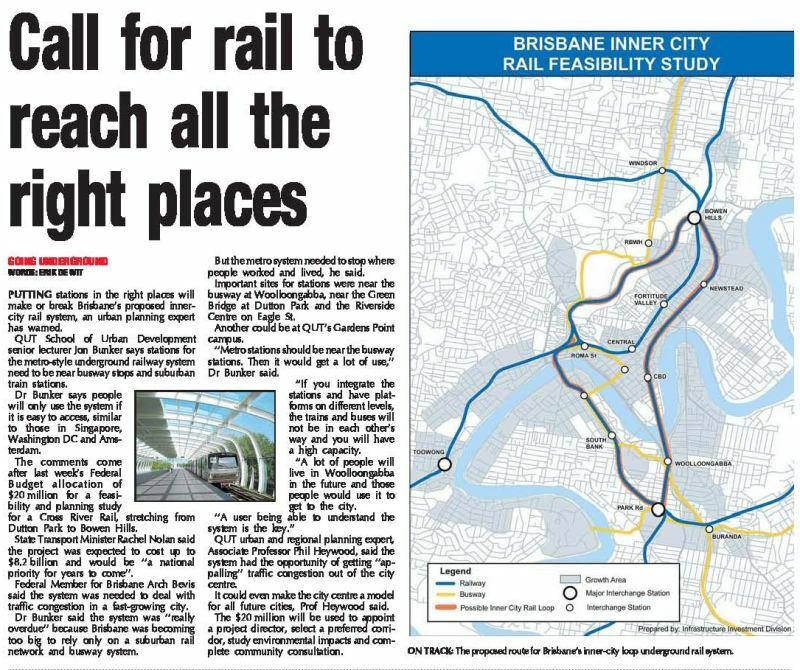 "With more people expected to travel into and through Brisbane's CBD, by 2026 the inner city will remain the hub of south east Queensland's rail network." The 2008 Inner City Rail Capacity Study indicated that demand for peak train services was forecast to reach between 70,000 and 80,000 people by 2016 and between 105,000 and 130,000 by 2026. The number of existing services would need to double by 2016 and then increase again by half by 2026 to manage this demand. The study identified two major rail projects, one to link the northern and southern rail lines and a second project to link the northern and western lines to handle the additional service requirements. Ms Nolan said a project director would soon be appointed for the Cross River Rail project. "This signature project offers the opportunity to make a mark on the landscape of the inner city, providing its rapidly expanding population with an integrated and innovative transport solution," she said. RAIL Back On Track (http://backontrack.org) a web based community support group for rail and public transport and an advocate for public transport commuters welcomes tonight's budget announcements for a number of rail projects throughout Australia. "RAIL Back On Track welcomes the commitments in the 2009 Federal budget for sustainable, efficient, safe, environmentally friendly rail transport projects for the future." "Australia needs to move forwards and break the transport shackles. All states need support to expand their public transport networks. Rail transport infrastructure investment is an investment that is repaid many thousands of times over and will provide employment during construction and its ongoing operation." "Of concern is the continued distortion to road funding. Road transport is unsafe, environmentally costly and is already failing badly. South-east Queensland is experiencing very significant road congestion. More roads is not the answer. Sustainable rail transport solutions are." "We welcome the commitment to fund the detailed feasibility and planning study for Brisbane inner city rail tunnels." "The commitment to fund the Gold Coast Light rail is visionary. Modern light rail will become an iconic feature of Australia's premier holiday destination. Sustainable, environmentally friendly, high capacity, safe. It is clearly the optimum mass transit solution for the Gold Coast." A project manager will be appointed soon for Brisbane's cross-river rail project, Queensland Transport Minister Rachel Nolan said yesterday. The Federal Governmment allocated $20 million in last night's Federal Budget to develop a detailed feasibility study for the project. 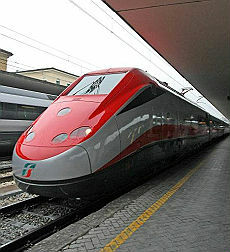 Projected rail passenger figures show the project is critical, with Citytrain services needing to double by 2016 to cope. Ms Nolan yesterday welcomed the Budget funding. There are two suggested stages to the project, which aims to build several underground rail stations and a second path across the Brisbane River. The cross-river feasibility study must finish next year and importantly identify how to fund the project, get it started by 2011 and have stage one running by 2016. Stage One is an $8.2 billion rail link between the Gold Coast and Beenleigh lines and the North Coast line running through Caboolture. Last year's Inner City Rail Capacity Study offered three sample routes coming into a large underground CBD station. The study also produced the figures showing rail patronage figures accelerating. Early morning Citytrain commuters will rise from between 52,000 and 53,000 today to between 70,000 and 80,000 people by 2016, and between 105,000 and 130,000 by 2026. However, Queensland's Opposition Leader John-Paul Langbroek yesterday questioned whether the project would start in 2011. "It is hard to see that happening when the only funding pledge in the Federal Budget was for a study," he said. Mr Langbroek said he was concerned regional Queensland had missed out in the Federal Budget and questioned the lack of assistance for the state's ports. "Our recovery from the financial crisis will be led by exports as demand for our resources increases globally, but there is no commitment from the State and Federal Labor Governments to address the bottlenecks and capacity issues that have long plagued Queensland," Mr Langbroek said. "The future of the Abbot Point stage three upgrade, doubling export capacity to 50 million tonnes, remains in doubt as the vital Northern Missing Link rail project continues to be delayed and ignored by both State and Federal Labor Governments," he said. I am sure readers will find this interesting, to say the least ..
Premier Peter Beattie has revealed the South East Queensland Infrastructure Plan will include an investigation of a new Brisbane River rail crossing and an expanded inner-city rail system. Mr Beattie said the project was just a taste of the Infrastructure Plan, to be released on 27 April. "This $4.5 million investigation could lead to a second rail bridge over the Brisbane River, or a tunnel under the river, plus new stations and tracks," Mr Beattie said. "It could possibly even lead to a new inner-Brisbane network of tunnels. "We will need a second rail crossing of the Brisbane River at some future date, to meet demand from the one million extra people who will live in the region in the next 20 years - not to mention the extra tourists and business travellers. "Estimates suggest the Merivale Bridge and CBD rail tunnels will approach capacity by 2016. "We are talking about a huge investment of dollars and thousands of jobs for skilled workers. "A river tunnel alone would cost well over $2 billion, while a bridge would cost well over $1 billion. "It is imperative that the planning, feasibility and design work are spot-on. "You could not have a tunnel unless you expanded the inner-city underground rail system." The investigations will commence in 2006-07 and take an estimated three years. "The rocketing popularity of the Citytrain network is driving planning for more rail services," Mr Beattie said. "Last year, through our Smart State Building Fund, the Government announced a $247 million expansion of track and rail services on the Beenleigh-Gold Coast line. "Add to this $123M for track duplication and extension of the rail line to a new station at Reedy Creek, which the government announced last month. "Ultimately, many of these extra trains roll into Roma Street across the Merivale Bridge. "I love this extra demand for rail, because it is a safe and environmentally friendly way to travel, and the more it is used the more we can invest in a world-class service for Queenslanders," Mr Beattie said. The Merivale Bridge opened on 18 November 1978, to meet the needs of electrification of the Citytrain network which commenced in 1979. "Back then, locomotives hauled passenger carriages," Mr Beattie said. "Today about 90,000 passenger services and 3,000 freight services cross the bridge in each direction every year. "The fact we are talking about another rail crossing 27 years after the Merivale Bridge was opened underlines the government's determination to plan smartly for the escalating popularity of South-East Queensland." RAIL Back On Track (http://backontrack.org) a web based community support group for rail and public transport and an advocate for public transport commuters has welcomed Minister Nolan's announcement that a project director would soon be appointed for the Cross River Rail project. "RAIL Back On Track welcomes the Transport Minister's announcement that a project director will be soon appointed for the Cross River Rail project. (1)"
"There is considerable rail engineering expertise in south-east Queensland which has been gained with the significant track upgrades presently under way. There is a pool of skilled personnel just waiting to move forwards with what will be a transport culture changing project." "There is tunneling expertise which has been gained with the construction of the Clem7 tunnel." "Lets leap forwards. Even at this early stage it is essential however to ensure that what ever is the exact final route for the tunnel from the southern line to the northern line, it pass under Central railway station and provide an interchange between the surface and underground systems." Good job with the media releases Bob. Thanks for highlighting the need for a connection at Central. It was interesting to see that the Budget overview publication incuded a figure with a rail loop including the Exhibition line and the Newstead-CBD alignment. Presumably this doesn't mean much, they were just looking for a nice simple figure. Todays morning peak meltdown adds to the justification for an immediate commencement of construction of an alternative heavy rail link through the CBD such as the underground cross river Fairfield/Dutton Park to Exhibition Loop (Bowen Bridge Road) link would provide. Thae avalibility of an alternative route through the CBD would this morning have minimised disruption to the system overall. Again the drisuption to commuters this morning further supports the proposal that QR Passenger be given total control of and responsibility for the commuter network from Nambour to Robina and west at least as far as Gatton and all associated infrastructure within that network. This works in Sydney with the Citytrain network and while it has its problems there from time to time it works decidedly better than the current system in operation here. One to ask Minister Nolan about. Thanks for the link, Paul - it certainly looks like the Exhibition rail line is included in the rail loop plan. has simply laid on his "expertise" on plans for a "metro style loop?". Unless i have read the article incorrectly, I believe such a system would still leave the heavy rail system vulnerable to congestion. e.g. There's no indication which route suburban trains from Beenleigh or Manly would take. Dr Bunker - Such information on routes are very important for commuters to voice an opinion. and most curious is no mention of how to avoid congestion at Bowen Hills ! Dr Bunker - When you attended "Transport Planning 101" didn't you see the benefits of avoiding as many choke points as possible. i.e. If there's any "emergency" at Bowen Hills the entire system is affected. Any additional platforms at Bowen Hills must be placed adjacent to existing platforms OR close to Windsor. Otherwise the choke point simply moves from the Merivale Br. to Bowen Hills. (As an aside, in the 1920's Dr J.J.C. Bradfield wanted to avoid such debacles but no one listened and to this day most train lines in SYD need to pass through the huge choke point from Redfern to Town Hall). Surely with 80 yrs hindsight AND computers we can learn from such basic errors. This article was placed in a beautiful position in City News, yet I believe the possibility of moving this project forward through such a beautifully placed article has been squandered. It's not every week such an opportunity comes by. Unless the majority of "experts" such as Dr Bunker get united with "a" proposal I fear we will fail to convince the decision-makers of the most effective option ! Last word from me today is - Experts built the Titanic ! I personally think that airport trains should still go through central to allow maximum line transfer possibilities. Then make the tunnel start so that both Cleveland and beenleigh lines are able to use it once 15 min peak is in 2 trains could go via south bank and the other 2 via woolongabba. There should be a metro line from NewFarm-CBD-West End-Toowong-StLucia. Actually, the 'Infinite Loop Metro' system proposed in another thread is pretty much what I want. And you could build one loop or parts of it at a time- and it would still work! Ha ha. Paddington/Ashgrove/The Gap miss out... but it is an extremely good plan. Does anyone know if the Infinity Loop system has been formally submitted? We need to be careful about rushing as the current tracks at Central can handle a lot more traffic than they are currently. At least 50 to 60 trains per hour in each direction. That would convey about 70,000 passengers per hour. The biggest restriction at this time is units and crews. Yes we need more track work for more options to provide rail to extra locations, but let us make sure we get it right. We are paying for lack of planning in the last 10 years. In the rush to compensate, let?s not ruin our future. Where did you get fact from? The Inner City Rail Capacity Study (which is written by people who seem to know what they are talking about) has 25 and 19tph as the maximum capacity for the suburban and main tracks respectively. Combined this is 44tph. Currently during the am peak the tracks handle 19 and 13tph, so there is still some spare capacity. I personally think that more than 20tph will be difficult operate on the suburban track due to long platform re-occupation times at Roma St and Bowen Hills, and long dwell times due to crew changes at Bowen Hills. - Speed code or distance to go signalling (either automatic or cab-signalled) - to reduce platform re-occupation times. Examples include SACEM used on Paris RER A. - Elimination of conflicting moves - by increased reversing capacity (preferably using centre tracks), using stabling near line extremities, removing capacity bottlenecks (such as single track sections), and building grade-seperated junctions at places such as Park Rd. An example would be to increase stabling or reversing points on Cleveland or Beenleigh Line to reduce the need for some peak Ferny Grove services to have to cross the main tracks at Roma St to get to/from Mayne. - Stopping patterns designed to make the optimum use of track capacity - this may involve making some expresses less express! - Additional high performance trains (and crew) - to handle increased services, reduce platform re-occupations times, and reduce junction clearance times. Even with the above, it should be noted that no suburban rail systems can handle more than 30tph per track (the 30tph club being Paris RER A, Munich S-Bahn, and Tokyo Chuo Line. These lines aside, few suburban rail systems can handle more than 20-24tph. central station isnt going to be able to take 70000 passengers. It wouldn't, even if there was the capacity to move 70000 passengers an hour through the inner city rail corridor. Roma St, Fortitude and even Bowen Hills take a fair chunk of the inner-city-bound passengers. Had a look at the map. It has the exhibition line being used! In my above post, I mentioned that using the ICRCS figures for max capacity there would be 44tph, which at 1000 pax per train results in 44,000 pax per direction per hour, and 88,000 in both directions. As not all passengers travel to Central, and based on current passenger distribution, Central would be handling around 55,000 pax per hour in the am peak. Station capacity is usually limited by platform access. Central has nine stairways accessing three island platforms, thus each stairway would have to be able to cope with approx 6,100 people per hour (this is an average figure, some stairways may need to handle more or less). If looked at in terms of a platform clearing before the next arrival, then you would have to clear 1000 pax in 144 secs on the suburban platforms. This would be 7 people per sec. For the main platforms you would have 2 x 1000 pax in 189 secs. This would be 10.5 people per sec. I think that Central could just about cope with these passenger numbers, but the access to/from the main platforms (5 and 6) could get congested. I assume you are talking about the various maps on the Inner City Rail Capacity Study? The Exhibition Line would have to be used by some trains entering/exiting service at Roma Street as there is a bias of services from the North. It should be noted that none of these services actually loop, they just run from Roma Street to Mayne via Exhibition. Unfortunately most of service are from the suburban tracks, so would have to make a conflicting move at Roma Street across the main tracks. If you referring to the route A option for the new tunnel, this would follow the route of part of the Exhibition Line but would probably be underground, and emerge from the tunnel between Bowen Hills and Albion. Just to clarify. (Correct me if I'm wrong.) The Cross River Rail Project is the first stage of the Inner City Rail Upgrade Project. It is the line that they want built by 2016 - and runs from Bowen Hills to the Dutton Park area. The second project will be the line linking to the west, and is currently scheduled for a 2026 completion.